Kate Quinn is a native of southern California. She attended Boston University, where she earned a Bachelor's and Master's degree in Classical Voice. A lifelong history buff, she has written four novels in the Empress of Rome Saga and two Novels of the Borgias, before moving to the 20th century with the The Alice Network. All her books have been translated into multiple languages. The novel opens in the middle of the action, as the Pope's mistress and her friends are hostages from the French army. Did you come to their story fresh, or did you read The Serpent and the Pearl, which came before it? 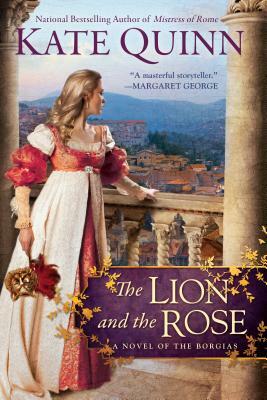 How did this affect your enjoyment of The Lion and the Rose? Did you have any other preconceptions about the Borgia family from legends, rumors, television, or other books? The dwarf Leonello and the cook Carmelina are quickly introduced as enemies. How do their feelings toward each other change over the course of the novel? Did their relationship change in the ways that you expected, or did it end up surprising you? Sancha (the Tart of Aragon) is roundly denounced for being a harlot, whereas Juan and Cesare, who behave in the same way, are not. Do you think this is fair? Why is Giulia not despised as Sancha is, though she is equally notorious? Leonello’s pursuit of a mysterious killer leads him to a dangerous game of cat-and-mouse with Cesare Borgia, and Giulia observes that both Cesare and Leonello enjoy “needling people just to see their reactions” (p. 155). What are other similarities and differences between the Pope’s son and the dwarf bodyguard? What about Leonello and Cesare’s other bodyguard, Michelotto? Giulia's affair with her Pope is filled with genuine affection at the beginning of the novel. When do you see her feelings begin to change? Did the change come from inside Giulia, or from Rodrigo’s actions, or both? Kitchen apprentice Bartolomeo is the only character who can match Carmelina's love of food and skill at cooking. How does the delicious food they make alter the course of events at various points in the novel? The murderer sought by Leonello meets a vicious end. Did he deserve that end, or did was there another way to stop him? What about the man acting as his squire, who was killed accidentally? Did you hope that Rodrigo Borgia would reform the Church and the city of Rome after his breakdown and epiphany? Were you pleased or disappointed by the outcome? Re-read the conversation in which Leonello leaves Giulia’s household. Did you expect their exchange to play out as it did? Were you as surprised as Giulia was? Carmelina speaks bitterly of the life that nuns lead. In your opinion, did nuns or married women lead more restrictive lives in the Renaissance? Each of the three narrators has a relic or a symbol of power that defines them: Carmelina has a true relic in the withered hand of her patron saint Santa Marta; Giulia has her floor-length hair; Leonello has his knives. What power do these relics really hold for their owners? How do they feel about their respective relics by the end of the novel? All the Borgias change radically over the course of the novel. Did you find their descent believable? Who do you think changed the most radically, and why? What do you think the future for them holds, beyond the end of the novel?